【RETRACTABLE & FLEXIBLE】When water flow entering the expandable hose, it will expand from 16 feet up to 50 feet, after water is released it will shrink back to its original size for space saving and easy storage. 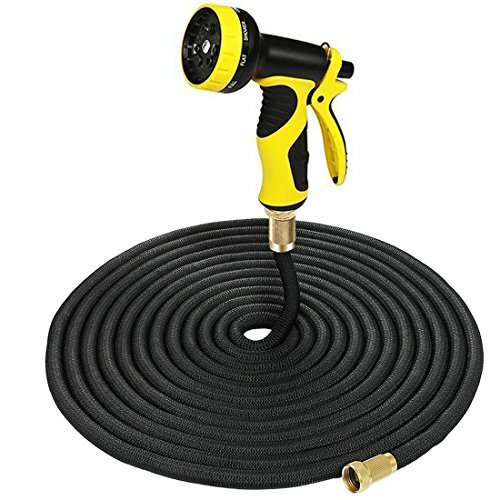 【DURABLE MATERIAL】Expanding garden hose and nozzle has been made from the highest-quality ABS and latex, the solid brass fittings and double layer natural latex core will not break, leak or corrode for strongest durability. 【9 PATTERNS SPRAY NOZZLE】The flex water hose comes with a spray nozzle (9 patterns: Flat, Cone, Full, Mist, Jet, Shower and Center, Angle, Soaker ), that will have the opportunity to be used for many different purposes, just turn the spray nozzle to adjust the watering pattern. 【WIDE APPLICATION】This lightweight water hose is suitable for washing car, watering grass / flowers / vegetables, cleaning windows / floor etc, suitable for high pressure water systems. Enjoy fun with this garden pipe around your house and garden. 【WARRANTY】We are committed to providing good quality products and customer service, we provide 24 month warranty and 100% satisfaction refund or replacement within 60 days of purchase, any question please feel free to contact us! I can't wait till Spring. Longest more durable water hose we've ever had!